The man dubbed “the Ian Dury of the 21st century” has teamed up with youngsters at Chichester’s Prebendal School for a charity single for Christmas. Ian Wills, dad to eight-year-old Summer, a student at the school, is hoping to break into the charts – all proceeds from the track will be donated to Macmillan Cancer Support UK and the Chichester Cathedral Choral Foundation Fund. The choice of recipients reflects the origins of the song, Mercy. Ian, who made his first album at the age of 42 in 2005, said “I was sitting in Chichester Cathedral with my girlfriend’s mum waiting for Summer’s assembly, and she said to me ‘The door of mercy doesn’t seem to be open much these days.’ She is very, very deep in her Christian beliefs, and we were just sitting there chatting. We were just generalising, but what she said struck a chord with me. I write every day, and so I wrote Mercy. She came to pick up Summer to do something one Saturday morning. I played her the song, and she was just blown away by it. As for that Ian Dury tag, Ian admits he can see it – and is flattered by it. The comment was made by The Times: “My first album was very Ian Dury-esque. I couldn’t get away from that. The second album had a raft of musicians and was a lot more vibrant and contemporary. But I still couldn’t get away from that Ian Dury tag. It follows me around! In late 2004 Ian formed his own band Wills & The Willing and it was in October of 2005 that Janice Long started to champion the band, when she played the single 21st Century Love Song on her Radio 2 programme. 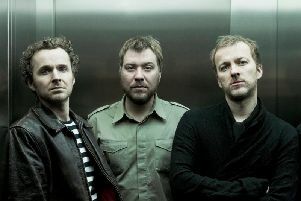 By the summer of 2006, the band was enjoying strong national radio and media support and was playing at festivals across the UK, including Guilfest. In 2007 Ian reformed the band, bringing in musicians and friends he had long admired to record the second album Heroes & Villains. The new line-up consisted of Ian, Sean Genockey and Charlie Morton. They released their first single Skin, which featured Didier Drogba and Michael Essien, a song used as part of the football anti-racist Kick It Out campaign. Their new album Dream In Colour came out at the end of October, featuring the single Butterflies. Now with a brand-new line-up and a bigger, more accessible sound for his third CD, Ian, who lives at Bracklesham Bay, finally believes he has settled on a definitive band line-up, with an inspiring set of new songs that will help take the band to a much wider audience.